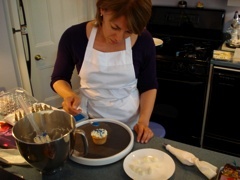 During the annual Great Glebe Garage Sale (a huge community garage sale in Ottawa), my family stumbed on Jennifer Barnaby, a Cordon Bleu Chef who was serving baked goods she’d made while her husband, Jim, brewed up espresso and handled the transactions. Every single cent collected from the sales went directly to charity. They didn’t even recover their expenses. That’s how I met Jim and Jennifer. I had one of their espressos and a piece of the most incredible cake I have ever had to kick off my garage sale spree. It might have been 9:30am.